Okay, I was thinking we were getting the hang of this. And then my husband offered to make breakfast this morning. This is a rare treat that I never turn down. I focused on getting ready and he got to work making awesome eggs—our last 4 eggs with whatever was left in the fridge, rolled up in corn tortillas. From my previous writings, you may have gotten the impression that I do all the cooking, and that would be correct. But it’s not because my husband is a bad cook. He can make a mean pizza from scratch. He is the fish-baker. And his tortellini salad might have had something to do with us falling in love. And normally his eggs—seasoned with garlic and basil—are delicious. 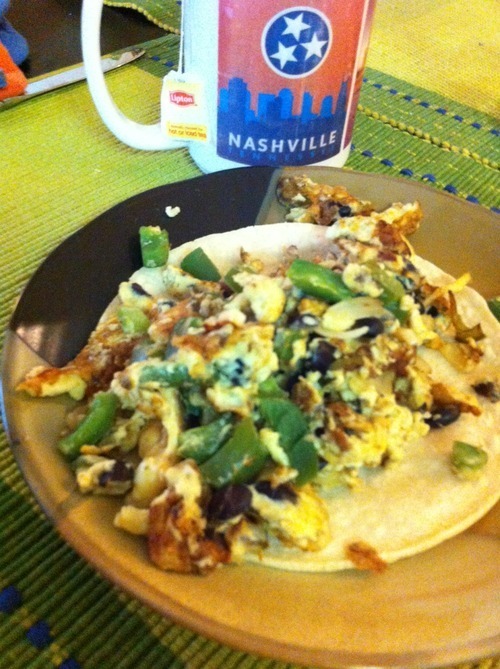 He had the eggs going with black beans, green pepper, garlic, and onion. And then he had to figure out how to heat up the tortillas. For about 90 seconds straight. So the eggs got a little done. My husband shouted some choice words when he turned around and realized what happened. I asked if they were ruined and his answer was, “Oh we’re eating them.” He knew that all experiments must be eaten. When I was a kid, this was when we got cheesy eggs (to cover up the dry taste). But we can’t add cheese to our eggs, so we got hot sauce. Not terrible for $2.13, including the important tea. Lunch was a little more foolproof. Peanut butter sandwiches. But to be safe, I made them. With a side of carrots and celery with hummus, our simple lunch only cost us $2.35. Despite loading that sandwich with a lot of peanut butter, I got hungry in the afternoon and took out my apple, a SNAP bar, and a homemade instant oatmeal pouch. These, plus my husband’s snacks, set us back $.99. Dinner was the easiest for me. All we had to do was microwave some leftover soup with rice for $1.40. And we both swear that this soup has gotten better each day we eat it. While enjoying our dinner, I asked my husband which meal had been his favorite so far, and he picked this soup (I have no grains of paradise, but used a mix of ginger and black pepper). That’s a pretty high recommendation for a soup that costs about $.60 per bowl. This is also a giant hint for anyone planning to take this challenge. I had a chance to get some ideas from a SNAP challenge veteran, Rebecca Messnerand her story published in the Urbanite this past summer. She also banked on soup, eggs, tuna, and oatmeal for several meals, and I took her advice. Facebook friends commented on our challenge and led us to this family of fourthat did a similar 100 day challenge (they didn’t include alcohol in their budget—smart folks!). They had to limit their organic produce purchases, plan their meals every week, and commit to not wasting ANY food. They did have the freedom to stock up when items were on sale in bulk and “purchase” them back in the week they ate them, which lifts a huge barrier in the SNAP budget. In our case, we wanted to purchase oatmeal and bought the smaller container for $2.29 instead of buying the large one for $2.50. I never would have bought a small container at that price, except that I needed that other $.21 to purchase other food for that week. For all of us the challenge is really twofold: 1. keep hunger at bay, and 2. try to stay healthy. We figured out how to accomplish the first one with a learning curve. To truly stay healthy on a tight budget, though, requires lots of time in the grocery store and in the kitchen, and lots of knowledge and creativity in meeting nutrition needs. For example, my sister worried that we weren’t getting enough protein. But I planned to have eggs and tuna on different days to make sure that we were spreading out our protein sources. And had lentils as often as possible. *If you haven’t already, find me on twitter @MarianHD1 and let me know what you think of my week, what we could have done better, and whether or not you’ve signed up for the challenge! Learning to live on a food stamp budget means making a lot of sacrifices. For example, the average per-person per week in Texas is closer to about $20. Imagine how much that would have changed your diet for the week. From what my research has showed me, that’s about the national average. Instead of having $60 for your week, you would have been stuck with $40. You have a huge advantage with your farmer’s market offering $10 in bonus bucks each week, which in theory gives you $70 in groceries, where in most areas of Texas you would have still been stuck with only $40. That being said, one thing I find difficult about reading these challenges is all the tips and tricks offered by veterans of the challenge, but in many cases it’s only a one week challenge. It’s very different to have to live on that budget for years. We’ve been living on a SNAP budget since 2004. Sometimes we’ve gotten more money from the program than others. It’s a hard living. What’s worse is most of us who live off of this kind of budget really don’t know the first thing about eating healthy on a budget like that. It’s not easy to know that you could have to go months with listening to your kids complain they’re hungry, or of wanting something so much better, but knowing that you really can’t afford it. Every splurge (like the mayor that chose to drink coffee) means cutting somewhere else. Oh, and good for the family that didn’t include alcohol on their budget. You can’t buy alcohol on food stamps. That’s something you’ve got to pay out of pocket for! I noticed you didn’t buy alcohol either, not that I think it’s really affordable on a food stamp budget even if you could use it.